Well, This is what the 'Chakalaka' sauce is meant to look like. Ingredients: This serves 4 to 5 people. 1/2 cup of chopped cabbage. 1 tsp of paprika powder. Salt, pepper and seasoning cubes to taste. Chopped veggies. Note the amount of onions? I love onions o.
I buy my sausages from Shoprite, they are just too yummy, there's even one that has the Chakalaka flavor. 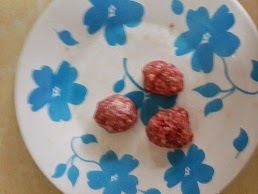 This is what the meat balls should look like. I had almost dumped all into the pot before i remembered to take a pic. Heat the oil in a pot or large pan, add the onions and fry till they are soft but not brown. 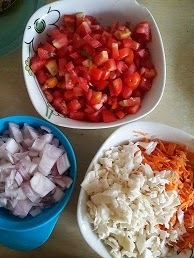 Add the garlic, tomatoes, tatashe, peppers, and stir. Wait for about 2 mins. Add the curry powder, paprika, thyme, ginger, seasoning cube and stir well. 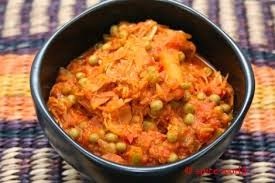 Add the spring onions, green peas, grated carrots, cabbage then stir all to cook for about 1 min. At this point i added a bit of water. Add some salt and stir, then add the sausage balls and cover the pot to cook for a minute. Turn off the heat then add the baked beans and stir. 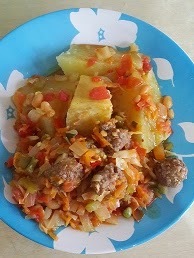 Serve with yam, potatoes, rice or etc. This is my finished product served with boiled sweet potatoes. Bursting with flavor! Choi i like food shaaa! I had mine with boiled sweet potatoes (totally healthy and great for weight loss) Chakalaka recipe has tomato puree in it but mine doesn't. I decided to make it that way. 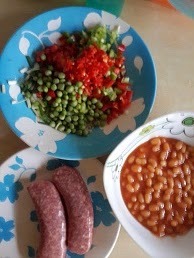 I had this as breakfast on Saturday morning, then added the left overs into my stew for Sunday rice. It was yummy for real. Single babes, if you are trying to win a guys heart, try this recipe, you will give a testimony...*runs a way*. Anyway, i hope you like it. Take care and God bless. Yes I removed thw meat from the wrap and moulded them into the sauce. Pls try it. Thanks and enjoy.